Jennifer K. Mann worked many years designing stores as an architect for a large architecture firm in Seattle. Then she had two children and, through reading them beautiful picture books, discovered that she really wanted to be a picture book author and illustrator. Jennifer's debut as an illustrator was in October 2013 with Turkey Tot (Holiday House), written by author George Shannon. 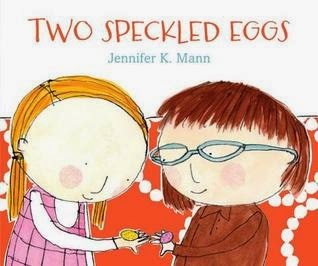 Two Speckled Eggs (Candlewick Press) marks her debut as author and illustrator. Her next book, I Definitely Will Never Get a Star on Mrs. Benson's Blackboard (Candlewick Press), will hit shelves in 2015. Something so inspiring to me is that while it may appear that Jen is an "overnight success," she has been working hard on craft for years. You can see her climb by the dates of her awards. In 2007, she won Second Runner Up in the SCBWI Western Washington Annual Conference Portfolio Showcase. She was the 2008 First Runner Up, and the 2009 Grand Prize Winner. 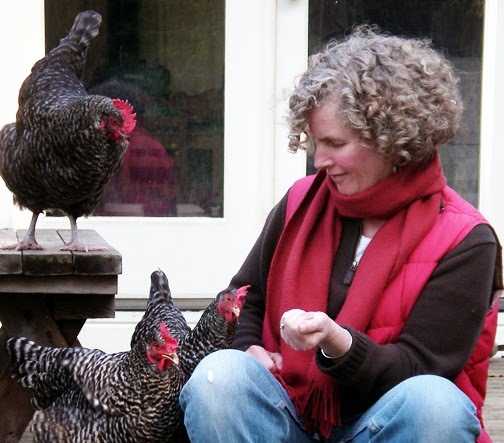 In 2010, Jen was awarded the SCBWI Don Freeman Grant in Aid for Illustrators. Currently, Jen volunteers as the SCBWI Western Washington Illustrator Coordinator, helping and inspiring others. She and the talented Margaret Nevinski are my critique partners. Dawn: Jen, I am super happy and honored to have you here for an interview! Thank you for taking the time! I always think it's interesting to hear about early influences. Who most influenced you as a writer? As an illustrator? Jen: As a writer and illustrator I would say I am most influenced by John Burningham, Polly Dunbar, Oliver Jeffers, and Kevin Henkes. I love their writing, and I love their art. When I was just starting to teach myself how to do this, my illustration "bible" was a wonderful picture book by Mary Lyn Ray and illustrated by Barry Root, called Alvah and Arvilla, and I also spent quite a lot of time looking at Judy Schachner's The Grannyman. Thank goodness my children had such a nice library of books--reading to them is really how I came to realize that this is what I wanted to do! Dawn: Tell us about your illustrating process. Jen: It's a little long and complicated to explain in detail here. But basically I do my line work and painting with traditional materials, like pencil and pen and watercolor, and then I scan them into my computer and use Photoshop to collage them into spreads. Sometimes I incorporate photographs, or textures that I have made in Photoshop, or found on websites that allow free use of downloadable textures. Dawn: The photos and textures in your illustrations are just a couple of the numerous things I admire about your work. There's so much expression in every character, you "zoom in" on all the right moments, and every page is a joy to experience. Lovely! Do you have any advice for aspiring authors and illustrators? Jen: Read and study tons and tons of picture books, if that is what you want to create, and take note of what appeals to you. If you are a writer, study the way the story is composed. Examine closely the choice of words, the moments that make you want to turn the page, the rhythm of the story and how it changes over the course of the book. Consider typing out the entire text so that your whole body can experience its qualities. If you are an illustrator, try mimicking your favorite artists and illustrators, just to find out how they do what they do. Look closely at how they knit the images with the words. How do they direct the scenes? Your own style will always show up in your work, but you will absorb the lessons of the masters if you look closely. Dawn: May I say how much I love that answer? Love! In the past, I've heard you talk about the ways you've studied and broken down favorite picture books, and it still blows me away. Truly, it's fascinating. Jen: Right now I am working on the final art for another picture book that Candlewick will publish next year. It is called I Definitely Will Never Get a Star on Mrs. Benson's Blackboard. The art is due May 15, and I still have lots to do!! Dawn: Good luck! I know it will be beautiful! Thank you again for the interview. Two Speckled Eggs was selected for the Spring 2014 Kids' Indie Next List--"Inspired Recommendations for Kids from Indie Booksellers." Two opposites may not be as opposite as they imagined in Mann's look at grade school cliques and oddballs. Ginger wants to invite all the girls in her class but Lyla Browning to her birthday party. Lyla wears drab clothes and glasses, and her affection for insects (not to mention her pet tarantula) is certainly unpopular among Ginger's crowd of friends. But Ginger's mom says it's all or none, so Lyla's invited too. But Ginger's friends turn out not to be the best party guests, doing whatever they want and ruining the games. At this point, Lyla is just part of the background with her ever-present magnifying glass. But that changes when she is the only one to appreciate the much-anticipated "silver-and-gold cake." And Lyla's present turns out to be the most thoughtful of all--a handmade bird's nest with two speckled malted-milk eggs in the center (two peas in a pod, anyone?) --and the start of a lasting friendship. Mann's pencil, gouache and digital collage illustrations keep the focus on the girls, their bright clothes and accessories standing out against the white background. The placement of characters in page composition plays a large part in getting Mann's message across, girls either center stage or relegated to the background (if they're even on the page at all!). For those of you in the Seattle area: Jen will be having a book event at 3:00 tomorrow, April 27, at Eagle Harbor Book Company on Bainbridge Island! I'll be there for sure!